Find Better Ideas, Faster ® with a custom hotel trend report, our PRO Dashboard and 80+ categories of premium trend reports. 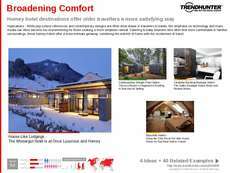 The Hotel Trend Report compiles and analyzes information on hotel design, amenities and packages that are most popular among various groups of travelers. Filtering through the many types of hotels that exist, the report hones in on the most popular themes and experiences provided. From homey getaways to more lavish retreats, the report outlines how the hotel industry is bursting with ways to innovate and attract new consumers. The report is for hotel industry professionals, large hotel brands and smaller boutique hotels to gain a better understanding of how to cater to particular interests of travelers and consumers. 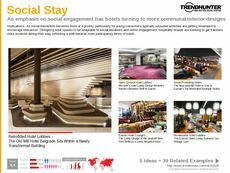 The Hotel Trend Report outlines the themes and types of hotels, hostels and inns that attract certain demographics, providing insights on how to have a hotel experience stand out from the rest.